Billionaire philanthropist Bill Gates brought an unusual prop to the podium yesterday. 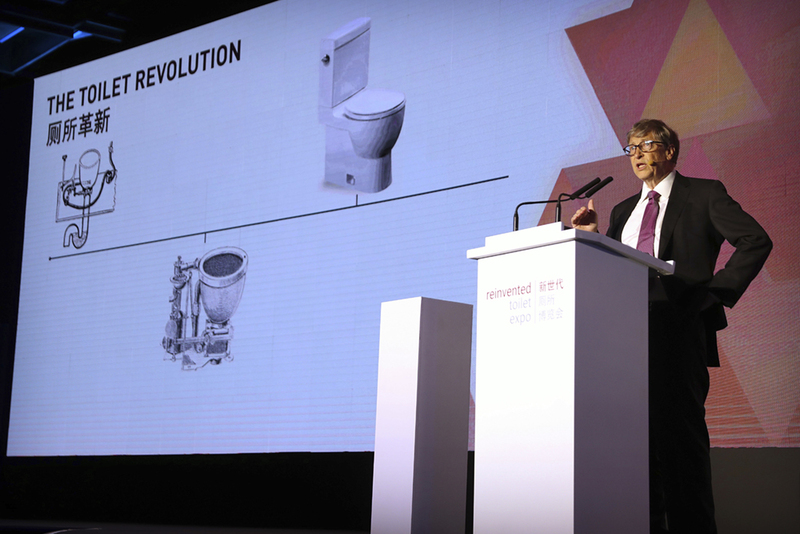 He was making a plea for the safe disposal of human waste at the “Reinvented Toilet” Expo in China. “You might guess what’s in this beaker—and you’d be right,” the former CEO of software giant Microsoft said. Gates wasn’t just being gross or sensational: He had a point. “This small amount of feces could contain as many as 200 trillion rotavirus cells, 20 billion Shigella bacteria, and 100,000 parasitic worm eggs,” he told the crowd. Gates went on to say that pathogens like these cause diseases that kill nearly 500,000 children under the age of five every year. More than 20 companies and academic institutions are exhibiting new toilet technologies at this week’s three-day expo in Beijing, from self-contained toilets to a small-scale, self-powered waste treatment plant called the Omni Processor. The expo focuses on the need for toilets that work without water-fed sewers—which much of the world does not have. The Bill and Melinda Gates Foundation has spent $200 million since 2011 to encourage research and development of safe sanitation technology. “The technologies you’ll see here are the most significant advances in sanitation in nearly 200 years,” Gates said. A United Nations group estimates that 4.5 billion people worldwide do not have access to safely managed sanitation—and that 480,000 children under five die every year from diarrhea, mostly in South Asia and sub-Saharan Africa. There’s an economic cost too. According to a study by Oxford Economics and Japanese toilet maker Lixil, poor sanitation cost the world nearly $223 billion in 2015. We don’t often think to be thankful for toilets. What other conveniences do you enjoy that you can thank God for? this is a great article considering thanksgiving is so close! and those are things that we dont need! I'm thankful for all the learning that is available to Americans. I'm also thankful for books. I am thankful for my family because they have supported me every step of the way. Including my choice to go into the marines and that I love baseball 1,000 times more than shopping (unlike every girl out there). And that I am totally not a normal girl.